I brought my foster dog to the Animal Fair this morning. The first parking lot was full, the second lot was full. I finally found a spot very far away and carted my stuff and one very excited dog to the meeting spot. There were so many dogs there. 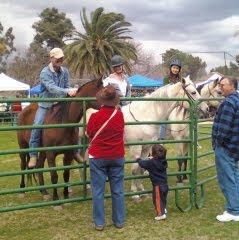 I loved seeing the purebred rescues. Their dogs look like clones compared to our mix of mutts. There was a pug booth, min pin booth, dachshund booth, golden retriever booth, cattle dog booth, husky booth and on and on. 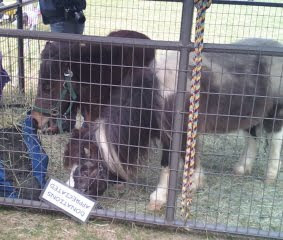 Then there were the farm animals for adoption. The goose? 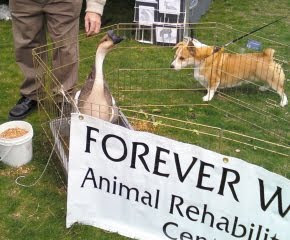 He was just representing the wildlife rehab booth. The goats. 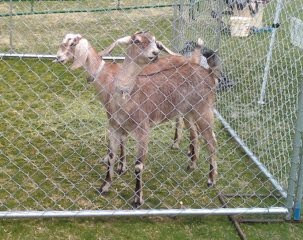 There were also cats and ferrets but I didn't get their pictures. Unfortunately, at noon the skies opened up and poured down rain. The fair was supposed to last until 4 but we were packing up by 12:30. Here we are huddled under the ramada trying to decide if it was going to stop raining or not. 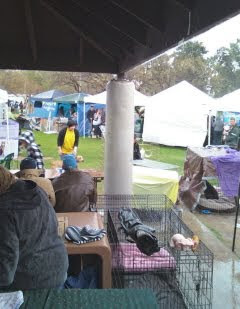 It was very disappointing that it got rained out because this is a once a year event which usually gets 5-10 adoptions for each rescue. I did hear of two little dogs who were adopted. Little dogs go quickly. The rescues are at full capacity and 6 dogs were put to sleep at the pound last week because there were no foster homes. Maybe they should think about organizing another fair in the Fall and make it a bi-annual thing. Despite the weather, it was an adventure and I'm glad I went. I hope I will still be fostering dogs next year so I can participate again. How many llamas did you bring home? 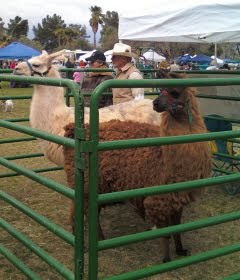 Ha, I don't need a llama because I don't have a herd of sheep. I hear they are excellent guard "dogs". I even saw some in Oregon standing guard over their sheep. I did want one of those horses though. Good thing it wouldn't fit in the back of my pickup.